Submitted by DM Wise on 2018-01-31 09:00. ... for two long years (582 to 584 CY), the nations of the Flanaess had schemed, murdered, and warred against each other until nearly all sides lay bloodied and beaten: war had exhausted the land and the people. Furyondy and Iuz ground to a stalemate; Nyrond's vast coffers were drained dry and its overtaxed peasants were rebellious; the Great Kingdom was shattered into a swarm of petty landholdings vying for power; Keoland fought invasion on all sides; countless men, dwarves, elves, and orcs marched off to war, never to return; farms stood empty; fields lay fallow. . . . The Flanaess could make war no longer. Proposals for a peace conference met with greater and greater acceptance. The puppets of the Scarlet Brotherhood, taking orders from the Father of Obedience, issued a call for a grand truce: every nation would cease hostilities and put its own house in order. In the end, through negotiation, intimidation, and even assassination, the Brotherhood's proposal found acceptance. The City of Greyhawk, untouched by the war, became the site of the conference. In the month of Harvester, the Great Council (as it came to be known) convened. The proposed truce, though simple in theory, proved an enormous undertaking, what with the countless ambassadors present. In the six months of the Great Council, intrigues abounded as each side attempted to gain the upper hand. The conference nearly collapsed more than once when ambassadors took umbrage over some real or imagined slight. The final act of the immense drama of war occurred on the Day of the Great Signing. A pact had been resolved and nearly all the nations had agreed to sign it. As this solemn ceremony got underway, however, a tumultuous event occurred. Even today a haze obscures the details: apparently someone plotted to annihilate the entire diplomatic corps in attendance, but the scheme misfired. A blazing explosion destroyed a good part of the Grand Hall only minutes before the ambassadors assembled for the day. A fierce magical battle immediately ensued, spreading havoc through much of the old city. When the fire and dust cleared, constables discovered smoldering robes belonging to two powerful members of the mysterious Circle of Eight--Otiluke and Tenser. The murderer of these wizards, undeniably a powerful mage, was discovered to be a third member of the Circle of Eight--Rary. Using secrets gained in confidence, Rary not only vaporized his two fellows but also tracked down and destroyed every clone the pair held in preparation. The motive behind Rary's treachery remains clouded. According to many who knew him, the wizard probably saw an opportunity to seize power and land in the confusion that would follow the assassinations. Others suggest Rary was a pawn of the Scarlet Brotherhood. With the plot discovered, though, Rary and his co-conspirator Lord Robilar fled the city. Unable to return to Robilar's castle, which was immediately seized by the troops of Greyhawk, the pair escaped into the Bright Desert. There they conquered the savages and established a kingdom of their own. Though small and mysterious, this growing state could someday threaten the very borders of Greyhawk. 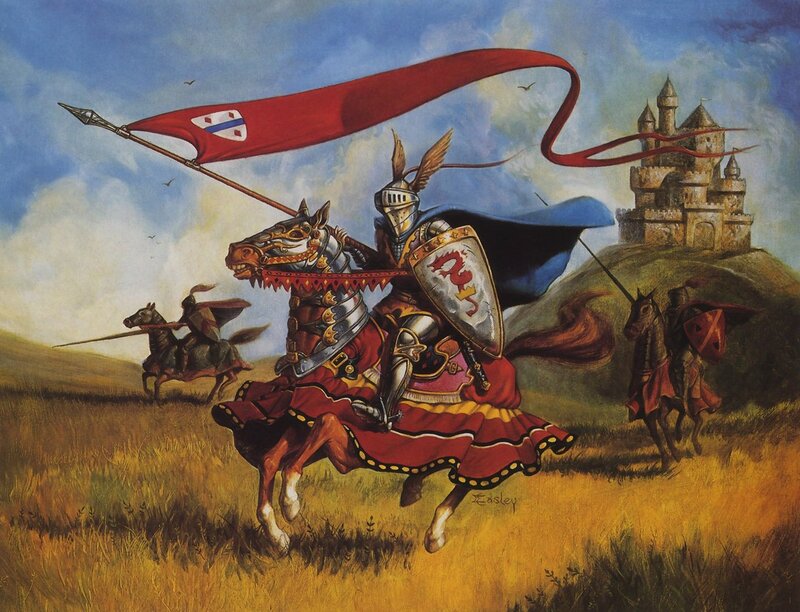 Fearing further disruptions, the delegates hurriedly signed the Pact of Greyhawk, and so the wide-ranging war of the Flanaess came to an end, and gained the misleading title, the Greyhawk Wars. The year is now 585, and a winter looms looms on the horizon. The Shield Lands lie in ruins. Critwall is an island surrounded by the forces of Iuz. Furyondy is stretched to the brink as they seek to check the advance of Iuz. To the south, an Empire stands where none has stood-- The Pomarj. Under the leadership of Turrosh Mak, they have carved a kingdom from the Wild Coast, the Suss Forest, the Principality of Ulek, and have seized control of the trade and commerce of the Woolly Bay. Few if any have escaped the last two years of calamity for the war has touched all. This is the world in which your hero lives-- a world filled with treachery, war, suspicion, intrigue and fear. This is the world of Greyhawk. I guess it is time to revert back to my youth, said the grey bearded old Wizard. Tally Ho! Can't wait to check this out! I'm so happy WoG solo has been updated! Strange, it worked for me. Does it have any story? Any nice quests? I never played online on this server so i have no idea. Is it anything like OC (story driven) or it will mostly feel empty without other players? While everything seems to be working, everytime I load my save it strips me of all items and gold and give me that 1000g as if I just began the game in that transporter room. I had played for hours, it was frustranting as hell. Anyone can help me sorting this out so it stops removing my items and gold everytime I load my save? It would be awesome. EDIT: Actually, I leveled to 3 and the problem stopped. Weird. Fallander69: It does have quite a few nice quests, and the quests have stories. No over all main story though. Hard to say if it will feel empty to you, it's a solo mod so has no folks you can add to your party like OC. It has never felt empty to me. Nicely done! I managed to go through the temple despite of the many many unusual respawns. I'm stuck in the nexus of the elementary planes though. Got all Gems. The Orb is missing. Is there a way back to the temple? P.s. : Some of the quests in Hommlet don't work, can't say why ("error"). Did you managed to do the moathouse quest in Hommlet for the druid or the priest? For the druid. The priest did seem to give the quest too though. The reward was given by the druid and later on the priest approved as if the quest was given by him...without sharing any xp or gold of course. Actually, I managed to do it. I had quite a surprise on how to proceed. The module have a lot of little details and I'm loving it. Updated version loaded: fixed world clock issue, and addressed quest-breaking feature in Cult of the Dragon adventure series, fixed some sea-based peril, and Abbor Alz has slight restructure. For those posting questions about things not working. More than likely that's a user-end issue which I'm not sure how to address. All of these things work live for the online server with 15 people on it.... so, not sure if I could be of much help. Often there can be conflicts (like overrides), or there could be a corrupted install or download, or a bad cep version, or maybe you don't have the cep_custom_hak in the right directory, it could be a cpu thing, or cpu affinity, or lack of ram ..... there's a lot that could go wrong along the way. You may download this version again and start from scratch. Just make sure to place things in their proper folders. I had some problems but a lot was my fault, either some other content I had installed or some little detail that had slipped my attention. I'm loving these little details. Thanks for sharing this. How does one get to the giants series? I have now added new versions of the 1.69 version with some bug fixes and an Enhanced Edition version. Note, one must have the Enhanced Edition in order to play the EE version. Hak remains consistent across versions. Unless there's some game-breaking bug is found, this will be the last update for some time as we focus our efforts on the live content. Thank you, Vault Community and your continued support of all things NWN. Tried this module with a few builds and I love it!